I save the few magazines that I ever buy just to have around when I feel like sitting on the couch with one. I was recently browsing through an Elle magazine (Oct. 2008) and saw this picture. 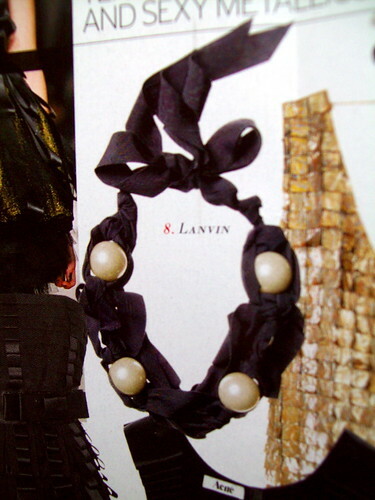 It is a pearl and grosgrain ribbon necklace by Lanvin for $1,320. I immediately thought of how I could make something similiar. Here is a quick tutorial on how to make a look alike for yourself (for a lot less!). 2. Take the 7 ft. piece and begin to crochet a chain about 1 foot in on one end. Crochet the chain until there is about a foot of ribbon left. End with a slip stitch. 3. 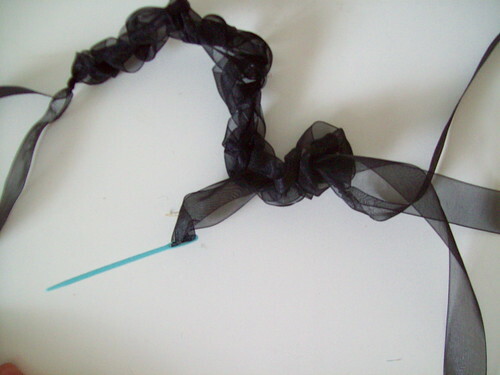 Thread the 3 ft. piece of ribbon on a yarn needle and randomly run and loop it through/around the crocheted piece. Make sure the ends left on side side are about the same length. 4. Knot the two pieces on the left side together right above where the crochet ends. Do the same for the right side. 5. 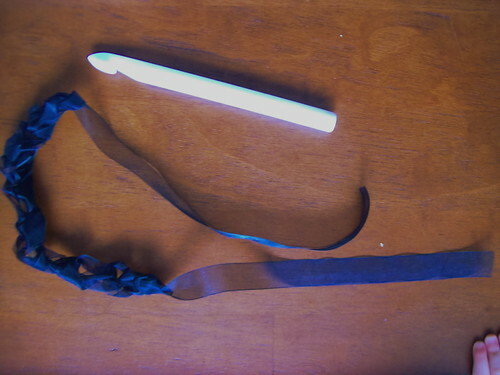 Heat seal ribbon ends with candle/lighter/wood burner. (cut them first if you would like them even too. I chose to leave mine like they were). 6. Glue on pearl beads. 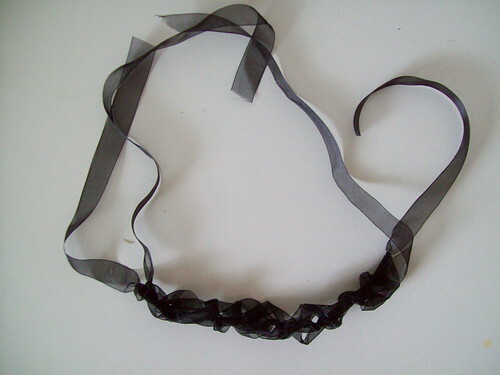 (I tried sewing, but they were too heavy for it to work on the organza ribbon). 7. Once dry, it’s ready to wear. Just simply tie it on, take a picture, and add it to the Happy Together Flickr group so we can see what you made. Just arrived at your blog through a linky to the ruffled scarf how-to from Craft Gossip (I think). Lots of adorable stuff. You look like you really enjoy being home with your little one. 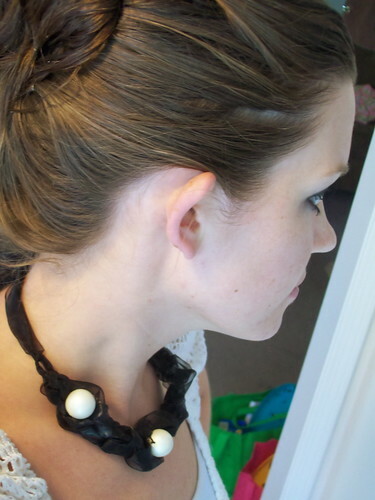 In today’s post and in the ruffled scarf how-to you have glimpses of a very cute updo. Would post a pic of the back that is a little more revealing and/or a brief description of how you are pinning it up? I will make a tutorial and share it with everyone 🙂 I will try and get it up by Wednesday. So pretty! I saw the link through Craftzine & had to take a look. Thanks for the tutorial! I will have to try this! very charming! i have to try this. i set a link to your post. “i set a link to your post. Looks great! It looked intimidating to make, as I am a novice at crochet, until I read your tutorial and it sounds totally doable. This is beautiful! Such a great tutorial… I linked to it on my blog. Oh a girl after my own heart! Now to rearrange things so I can give this a try tonight. LOVE IT! I’ll be linking. Super well done tutorial and gorgeous work! What a gorgeous necklace, I really think yours looks better than the original. To my eye the 4 pearls look odd, I was always taught that odd numbers (beads, embellishments) look better. I linked to this tutorial today on Dollar Store Crafts! Thanks, it’s awesome! You do such a great job. I just found this on dollar store crafts. BRILLIANT! I never actually make jewelry, but I may have to start. Because of this. Couldn’t you also just string the beads on the ribbon and then crochet them evenly in the strand? It would take less time and no glue that could come undone later. 🙂 Looks great! I so would have done that if the holes on the beads weren’t so small. The ribbon was too wide to even begin to get through, let alone trying to get it through the beading needles I had on hand. I say go for it if you have beads that it would work on 🙂 Thanks for the suggestion! This is so creative…thanks for sharing your tutorials! Beautiful necklace! I’ll have to try it sometime! Love your blog! This necklace is so lovely and equally as nice as the original, if not better. Love your blog and have put a link to this tutorial on my blog. Will check back soon. 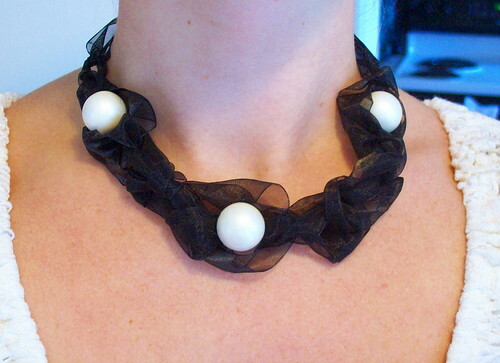 This is so gorgeous, I wish I had some ribbon and pearl beads lying around so I could try it right away. Thanks for the tutorial! Hey Jessica…it is really a 10 feet ribbon I’m looking at ??? It doesn’t look that long…10 feet would be 300 inches..right ?? I know it seems like a lot, but the crocheting really takes a lot of the length. The spool of ribbon I used had five yards on it, so I almost used a whole spool. 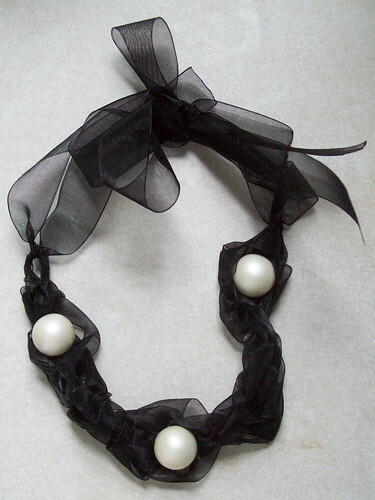 This necklace takes a little over three yards, so when looking for ribbon you can check out the yardage. You might find you might want it even longer too, depending on how tight you want it to your neck and how long you want the pieces to tie to be. Stumbled upon your clever tutorial whilst looking for ribbon jewelry how-tos! Thanks for sharing. I will be linking in an upcoming blog post. A very stunning necklace, just found your blog via Beading Gem’s regular updates to my inbox. Unfortunately, I can’t crochet to save my life. It is the only thing that is preventing from making this necklace I suppose. Thanks for sharing, I hope you have loads of fun wearing your necklace. Hi Jessica, I decided last week that I was going to make this necklace as a Christmas present for my best friend. I went shopping yesterday and made two yesterday – one for me and one for her. They’re absolutely beautiful!! 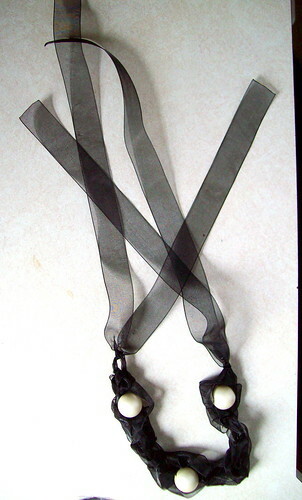 I did it in an antique style, using champagne/skin tone ribbon and greyish pearls. I will post a pic soon. Such an inspiring design ! It’s also nice of you to show how you made it! You did a beautiful job of replicating the necklace. By having different materials you gave it an upbeat and elegant look. Great tutorial.